The Project 11356 frigate Admiral Essen has left the Russian Baltic Fleet’s Leningrad Naval Base and gone to the Barents Sea to continue its state trials, the Russian Western Military District’s press office said on Wednesday. "After the frigate covers a distance of about 2,000 nautical miles, the crew will continue testing its equipment and weapons at Northern Fleet sea ranges as part of its state trials," the press office said. 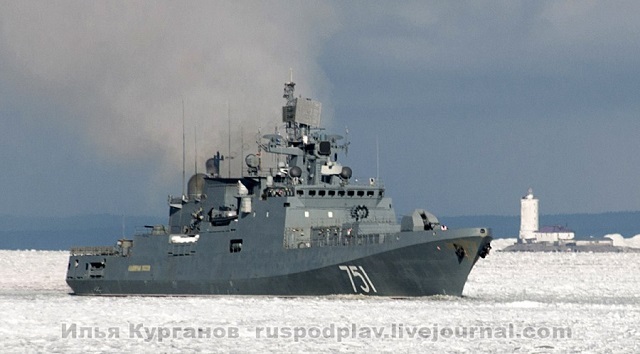 In Kronstadt, the frigate has been prepared to undergo the state trials at northern latitudes, the press office said. Its fuel, water and food supplies have been replenished. The crew has undergone training, in particular, to learn to operate the frigate in stormy weather and harsh weather conditions. During its passage, the shipyard’s team for the frigate’s handover, the crew and members of the state commission will continue testing the frigate’s maneuverability and speed characteristics, checking all its systems and units, navigation and radio technical equipment. The crew will also take part in dozens of exercises onboard the frigate. In particular, they will practice fighting for the vessel’s survivability, ensuring secure communications, providing air defense, etc. When the frigate Admiral Essen accomplishes assigned missions with the Northern Fleet, it will return to the Yantar Shipyard in Kaliningrad in west Russia where it will be prepared for joining the Russian Navy. The naval flag will be hoisted on the frigate Admiral Essen after its state trials are completed. After that, the frigate Admiral Essen will become the second Project 11356 vessel to join Russia’s Black Sea Fleet. 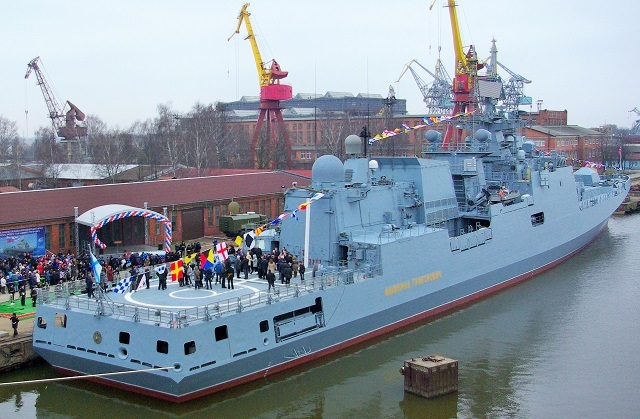 The frigate Admiral Essen was laid down at the Yantar Shipyard on July 8, 2011 and put afloat on November 7, 2014. It is planned to join the Russian Navy by May 2016. It was reported earlier that the Russian Black Sea Fleet was expected to receive three Project 11356 frigates in 2016. The Russian Navy is planned to receive the third Project 11356 frigate Admiral Makarov in summer. The Project 11356 lead frigate Admiral Grigorovich joined the Russian Navy on March 11. Project 11356 firgates are equipped with 100mm A-190 naval gun, Kalibr-NK (SS-N-27 Sizzler) cruise missiles, Shtil/Shtil-1 (SA-N-7 Gadfly/SA-N-7C Gollum) naval surface-to-air (SAM) systems, torpedoes and one Ka-27 (Helix) helicopter (optionally). Project 11356 frigate has a draft of 3620 t, a length of 124.8 m, a maximum speed of 30 kt and a range of 4850 nm.